LOVE. The two latest additions to my wardrobe: The stunning House of Harlow Chelsea sunnies + this awesome long haired beauty from Back Stage* (which kind of reminds me of this bag that I blogged about a 100 years ago, love!). Can’t wait to wear them both!! 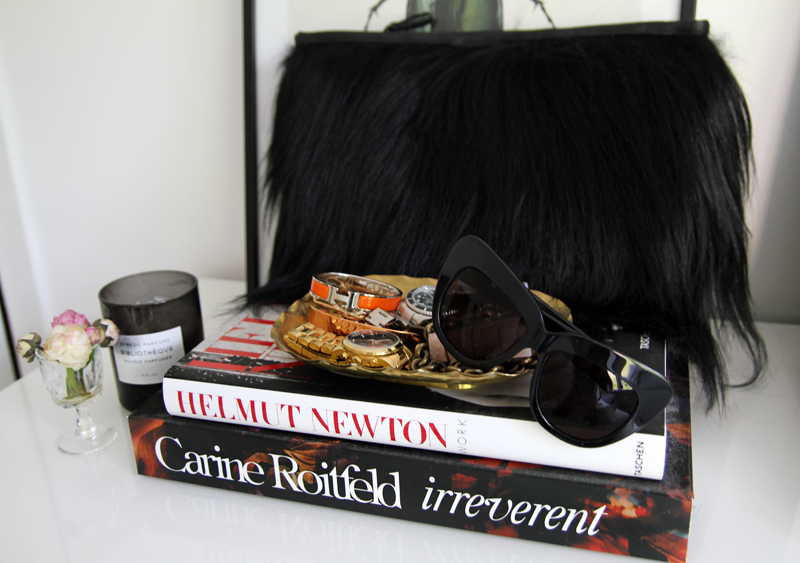 This entry was posted in Details and tagged back stage*, furry bag, house of harlow chelsea sunglasses, Interior design by Carolina Engman. Bookmark the permalink. I love the sunnies.. I want them too! I really need to invest in a pair of QUALITY cat eye sunnies!! these seem pretty perfect! the bag is soooo cute!!! Very glamorous. I’ve been looking for some cat eyed sunnies too. Your is fabulous! it s a long time i am in love with ur glasses!! More cat eye sunnies? I guess this is a case where “too much of a good thing” just does not apply. Those sunnies look perfect, perfect shape and everything! IM JUST LOVING YOUR FURRY BAG SOOO MUCH! Lovely picture! Great sunnies and love that bag! I spot a Hermes enamel bracelet! I miss the sunglasses with the cat ears (?) you used to wear! Those sunnies are absolutely beautiful! oh my, i loove the sunglasses! Love them both!! Especially the bag, so unique!! Nice choise! Those shades are so groovy! Very retro and I love them! The whole color pallet of this picture is so great as well! I love the sunglasses and the bracelet,and the furry handbag make me feel uncomfortable. i have always admired this bag. so beautiful! The picture is so cool and i NEED these sunnies ! oh we loveee that bag! I think the bag is definitely more for winter, but the sunnies are very cool ! Major Meeoooowwwww with the cat eye sunnies and the furry bag. Total Catwoman, LOVE IT! I am in love for this bag! I love this “Still life” looks great! The bag is def. something I can see leandre medine have, because it looks like it was just ripped off the back of a gorilla or some hairy ape creature, bigfoot? I can’t imagine all the shedding though, hopefully it doesnt. The sunnies are lovely and so “fetch”. Gorgeous bag. love this picture! Love the House of Harlow shades. Great wardrobe additions. Both the bag and the sunglasses are gorgeous, can’t wait to see how you style them! Ohh i need this Carine Roitfeld book, she is so awesome! Wow! That bag is gorgeous!! OMG! give me your purse? please! Love these items!! They are both so stunning! I love the bag!!!! AMAZING! He-he, I too love furry bags, I have a similar one but feathers instead of hair. Supercool bag! So chic and pretty pieces! Obsessed with all things here! Love your blog, it’s fab!